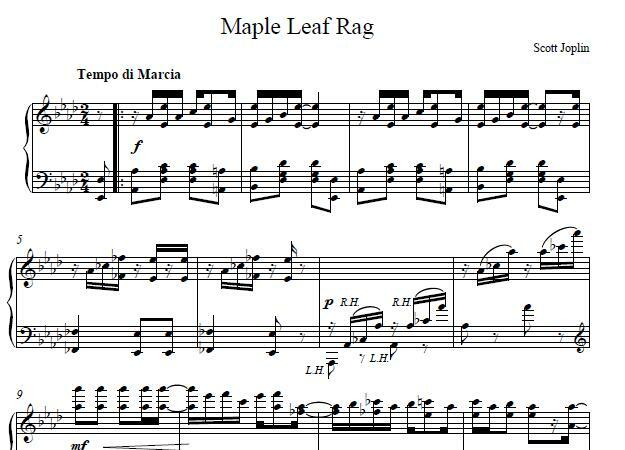 Maple Leaf Rag is one of the earlier “rags,” or pieces of ragtime piano music, composed by Scott Joplin. If it’s not his most well-known rag (other than perhaps The Entertainer), it’s certainly one of them. In his lifetime, Maple Leaf Rag was certainly more lucrative than most of Joplin’s pieces, probably because prior to publishing it, he partnered with a young lawyer named Robert Higdon. As part of their agreement with publisher John Stark, Joplin was given 1% royalty on each Maple Leaf Rag sale. This might not sound like much to us—but in 1899, it still gave him at least that source of income for the rest of his life. That income started out small, however. Sales in Maple Leaf Rag’s first year only amounted to about 400 copies, for a couple of reasons: first, that it was part of Stark’s early ventures as a small publisher; second, Maple Leaf Rag’s not the easiest piece to play! As Maple Leaf Rag became more popular, however, its sales rose dramatically—to the point that by 1909, some sources claim that almost half a million copies of the rag had been sold, a pace it would keep up for the next twenty years. That popularity, in turn, no doubt contributed to Joplin being dubbed the “King of Ragtime,” a title that would linger even after he died in 1917. Maple Leaf Rag has continued to be popular with pianists today, many of whom have recorded it; among these was Joshua Rifkin in 1970, on a recording of rags that became so popular that it became Nonesuch Records’ first million-seller. So when you play this challenging piece, remember…you’re in some famous company! If you enjoy this rag, you will enjoy a list of our ragtime from Scott Jopline, such as A Breeze From Alabama Sheet Music, Felicity Rag, Fig Leaf Rag, and many more online piano lessons and piano sheet music.